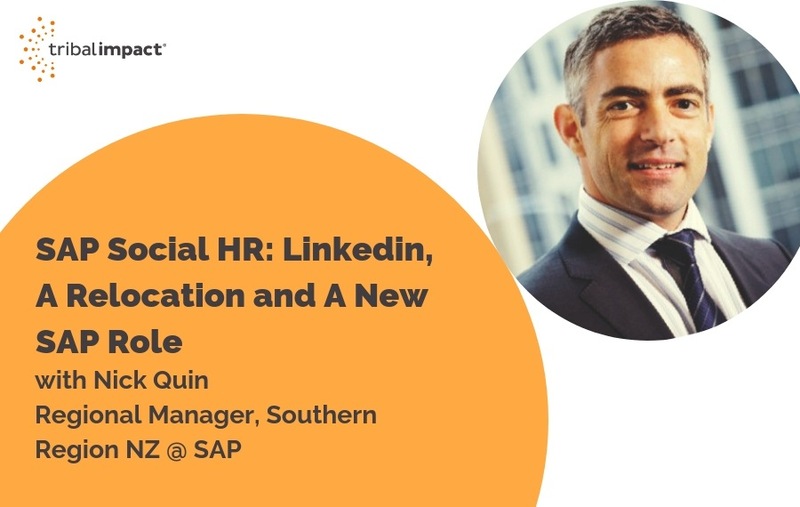 Nick Quin is a regional manager in the NZ region, leading a team of people bringing SAP's enterprise and cloud solutions to organisations across Wellington and the South Island of NZ. We spoke to him about how powerful a tool like LinkedIn can be in not only helping you reach your target customer base, but also how it plays a vital part in gaining the role in the first place. As with all great stories, there must be a beginning. After a successful career across Europe and Asia, Nick started to feel the call of home. But it meant starting again. Nick tells us that, as he’d been gone for nearly twenty years when they planned to return, he had to start from the beginning. There was no network or strong past relationships to rely on. In fact, when he looked at his LinkedIn statistics he could see his network consisted mostly of Europeans, due to his Danish employer, Asians and Australians. The New Zealand business community was nowhere to be found. Nick’s passion for authenticity online comes through in his advice for others when building a network. The power he talks about, lies in being yourself whenever you interact with others online, and most importantly to connect using your own personal tone of voice and terminology. LinkedIn has become a powerful tool in many ways, from enabling social sellers to connect with their customers on a regular basis, as well as providing a platform for thought leaders to share their expertise without leaving the comfort of their office. 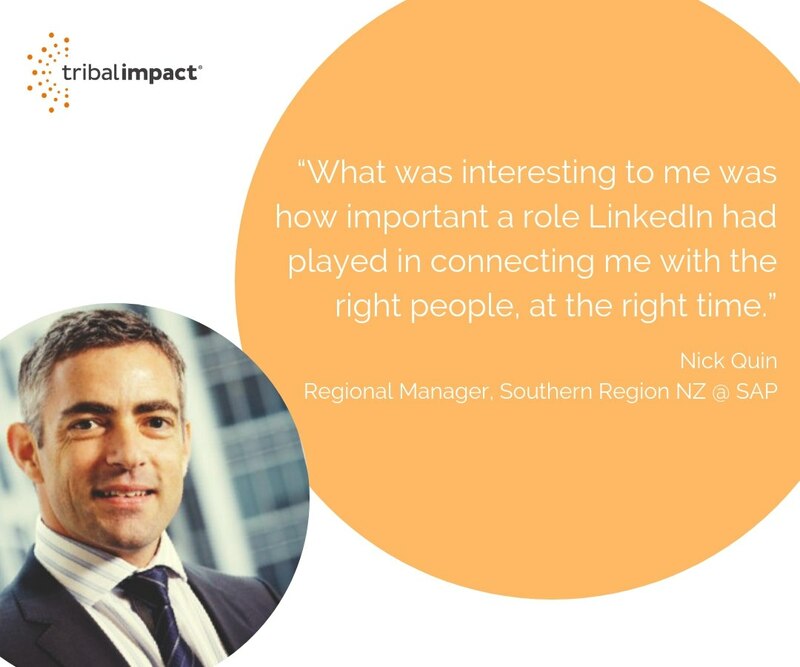 But one of the most powerful uses of this ever-growing network, is the ability to connect people with roles, as was the case for Nick. “My network grew over time and started to result in coffee meetings. It was a fantastic period of time where I met a wide variety of people and learnt a lot. One such meeting resulted in a referral to SAP. Interestingly, the hiring process took over two months, with back and forth meetings and discussions, online and in person. I was in Singapore at the time. “Today, I use LinkedIn slightly differently, but with the same intention. I often still grab a cup of coffee, and just browse through my network, looking for new connections. In a place the size of Wellington, with just a few clicks you can be connected to someone such as our Prime Minister, Jacinda Ardern. It makes for a powerful network of people.” Nicks suggests amusedly. And this seems plausible in the world of social media, especially when we’re supposed to be only six connections apart from everyone. But how does Nick stay connected to the network he’s put some much time into over the past two years? Secondly, he reminds us all to post meaningful content. There’s often no benefit in sharing company-written, uninteresting, blog posts or videos. You need to make it your own, add a spin or share something targeted to your audience. The best conversations come from being interesting. Having a genuine opinion has never been more effective in today’s online world. Nick’s method of tracking his social activities isn’t about pens and notepaper. It’s about looking at your data and understanding what it means for you. “When I began to build my network in New Zealand I started to see a dramatic shift in the users engaging with me. My top engagers were coming from NZ, and I could see the impact my actions online were having.